Today is an important day not just in the world of football but for the country as a whole. There is finally some sort of closure for the families of the 96 people who tragically lost their lives on 15th April 1989 at the FA Cup semi-final between Liverpool and Nottingham Forrest. All the documents which have been withheld from the public for over 20 year’s decades have now been released and the evidence is damning. Nothing can possibly comfort the families of those who died that day but now the country has finally heard the truth and how the blame should be laid squarely at the feet of the government and the administration of this country. It will take more than a few hollow apologies to heal the woundswhich have remianed open for so long, and the scars of the whole fiasco will be present for a long time too come. As I was born in 1990 and was not around when the Hillsborough disaster actually happened, the significance of those events has not passed me by. Especially as I was born and bred in Bradford, a City which has suffered its own football disaster in the Bradford City Stadium fire in 1985. I have been consistently shocked by all the things I have seen and read over the years on the Hillsborough disaster as well as the astounding levels of negligence shown by the people whose job it was to keep the fans safe. I read an article by Brian Reade of The Mirror today which really did bring the disaster closer to home for me from a man who was there that day, Brian really did bring a tear to my eye with this piece. You can view the article here. 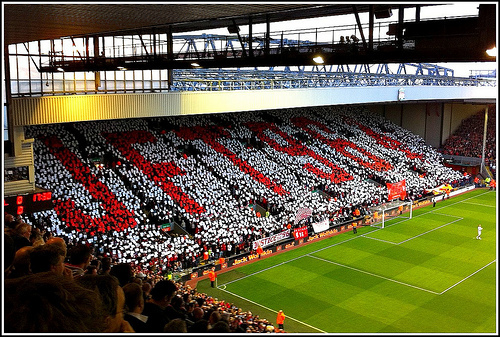 It is beyond comprehension that the cover up (often termed the second Hillsborough disaster) that ensued following the initial tragic events on that Saturday afternoon has been successfully buried and hidden from the public eye for 23 years. I cannot believe how no one has been held officially accountable for the series of shocking failures that occurred that day by the major decision makers and some of the officers on the ground. It is also sickening to think that 41 of the people who died could potentially have been saved up until 4pm rather than the 3.15pm “cut off point” which the coroner of the initial inquiry suggested, had there been enough paramedics and emergency service personnel on the field to assist the casualties. Moreover, the shocking conduct of The Sun newspaper is also a disgrace to football and to Britain for the way they jumped straight on the bandwagon blaming the Liverpool fans. This story was instigated and pushed by officials who were looking for scapegoat for their failings and conjured up the story that Liverpool fans were drunk and violent during the disaster. It has taken several inquiries over a long, long period for any officials to even acknowledge that serious errors were made by people in the police force and in the administration. The apologies of the Prime Minister, David Cameron and the South Yorkshire police force are only the start of the vindication and process of closure. Although, the disaster will never and should never be forgotten it can now begin to be laid to rest. I hope that actions can be taken in light of the evidence released today and the Attorney General Dominic Grieve applies to the High Court to order a new inquest into one of the worst football disasters in our history. ← A blistering first week in the Premier League!